Architects have been stuck with layered architectures for more than two decades starting from 1 and 2 tier to n-tier architectures. They are still using the same model with modern microservice architecture (MSA). At the same time, the industry mostly uses reference implementations as reference architectures. Furthermore, even though most enterprises use agile development and project methodologies, in practice they follow agile-waterfall or fast-waterfall methods. So how can an enterprise move to a truly agile execution and what architecture facilitates this methodology? In this session, Asanka will deep-dive into WSO2's brand new reference architecture and reference methodology for agility introduced by Tyler and Paul in their keynotes. Asanka is an author of these two concepts and the technical papers that describe them. 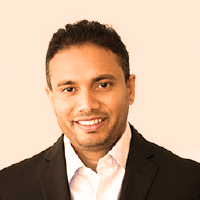 In his current role, Asanka drives efforts to create, refine, and enhance WSO2's corporate reference architecture and is responsible for spearheading a thought leadership outlook that defines WSO2's corporate reference methodology for development, customer success, and implementation. Working closely with customers, partners, and analysts, he will continue to evangelize WSO2's technology vision as in his previous role as VP of Solutions Architecture through which he gained extensive customer consulting experience and in-depth knowledge of solution architecture. Asanka has over 20 years of industry experience, which include designing and implementing highly scalable distributed systems, SOAs and microservice architectures in the financial domain, mobile platforms, and various business integration solutions. He is a committer of the Apache Software Foundation.